This 41mm. 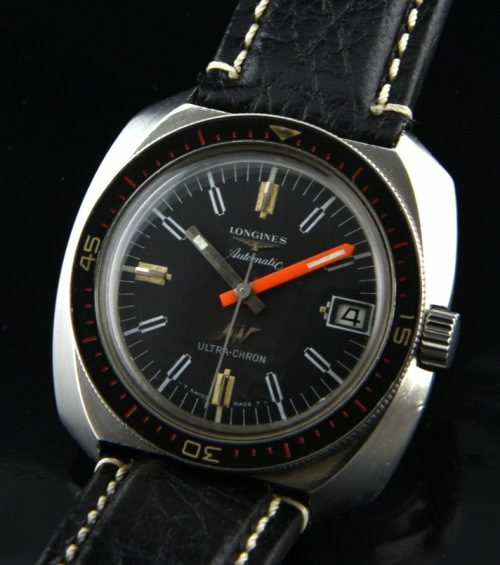 LONGINES Ultra Chron vintage 1970’s dive watch is one of those under-appreciated Longines watches many collectors are beginning to seek. The steel case has a name inscription on the screw-back case rear and a minor ding near the crown and otherwise looks great. The black original dial with eye-catching orange minute hand is all original and very clean. The turning original bezel with red accents looks very good. The high-beat LONGINES automatic winding movement was cleaned and is keeping time. This watch looks great with jeans or a suit. Just $1995.